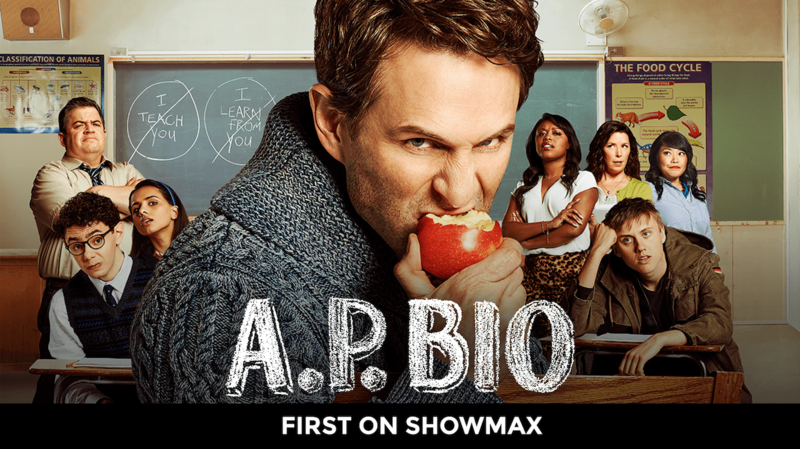 When award-winning philosophy scholar Jack Griffin (Glenn Howerton) loses out on his dream job to his rival Miles Leonard (Tom Bennet), he winds up moving back to his home town, where he’s soon stuck teaching AP Bio (Advanced Placement – which means that some course credits can be transferred to students’ university-level education) at Whitlock High School. Jack immediately declares that he has no intention of teaching whatsoever (or learning from his students in that touching Hollywood way). But realising he has the school’s smartest kids at his disposal, he decides to turn their dangerous minds to the task of helping him to depose his rival. Those students need not fear missing out on their biology education completely, though. Jack himself makes for an interesting study in primatology, in these four lessons, as he beats his chest (figuratively) and monkeys around. In episode one, Jack’s first move to establish territory and dominance in the classroom is a classic primate show of aggression and violence. He crashes his car, making a loud noise. He visibly threatens a cyclist and only turns away once the other primate is on the ground in a submissive posture. He bursts into the classroom speaking in a loud voice and noisily flinging a weapon (a crowbar) down on his desk, while maintaining aggressive eye-contact. Think of a chimpanzee rushing at its rivals while whipping tree branches around in a charging display. In episode nine, Jack’s students have each been given realistic robot babies in their health class. Jack is clearly not a fan, and when his students refuse to ignore the annoying, crying babies, he eventually drowns and destroys them in the school swimming pool. This is classic primate behaviour seen in a dominant male taking over a troupe. The new leader of the troupe will destroy all unweaned babies, thus wiping out his predecessor’s legacy. Jack is simply re-establishing his dominance over his students, and destroying another outside influence over the group (their health teacher’s) to ensure the survival of his own curriculum. In episode 11, while Jack is trying to intimidate his students into confessing, he peels and eats a banana with loud, smacking noises while staring at Victor (Jacob Houston), about 30 centimetres away from Victor’s face. In primates like humans, macaques and baboons, violating personal space causes anxiety because it signals a higher risk of physical aggression, because now you’re in the space that the other primate needs to protect themselves from predators. But a banana, Jack? Could you be any more obvious?